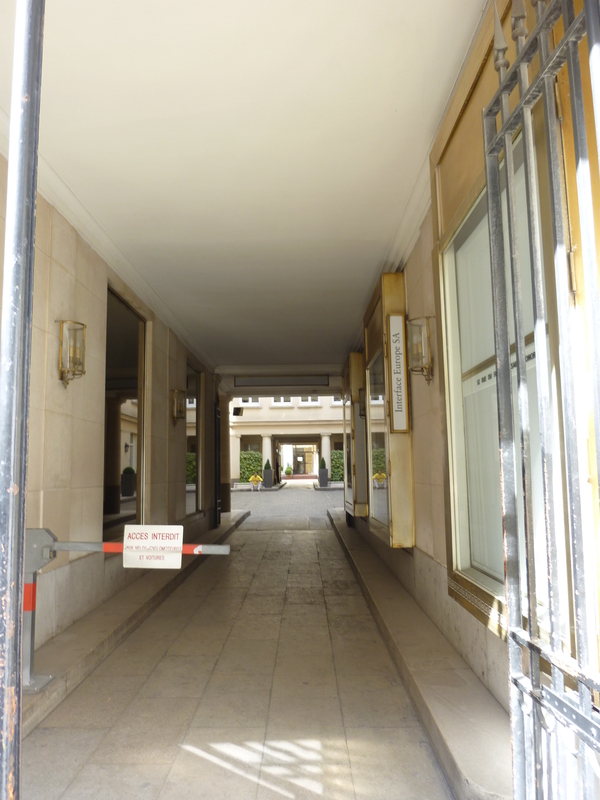 One of the distinct pleasures to be had in Paris is the feeling you get when you open a door into a private space. Enter a digicode and hear the satisfying click-thunk sound, or simply push open a closed but unlocked door to find yourself in the world that normally only Parisians would see. 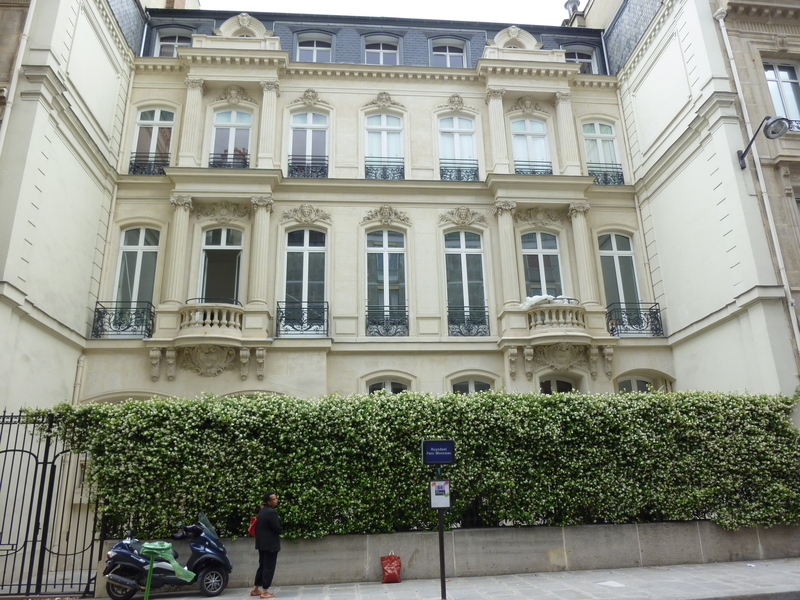 The first apartment we rented in Paris was enormously satisfying to enter. First, there was a huge street door big enough for a coach and horses to pass through, into which was cut a smaller door. Although it is now protected by a digicode, back then one simply pushed the little door and climbed over the raised sill. A short but spacious passage led into the courtyard. To one side was a full-sized tree and a flowerbed with some bushes and plants. 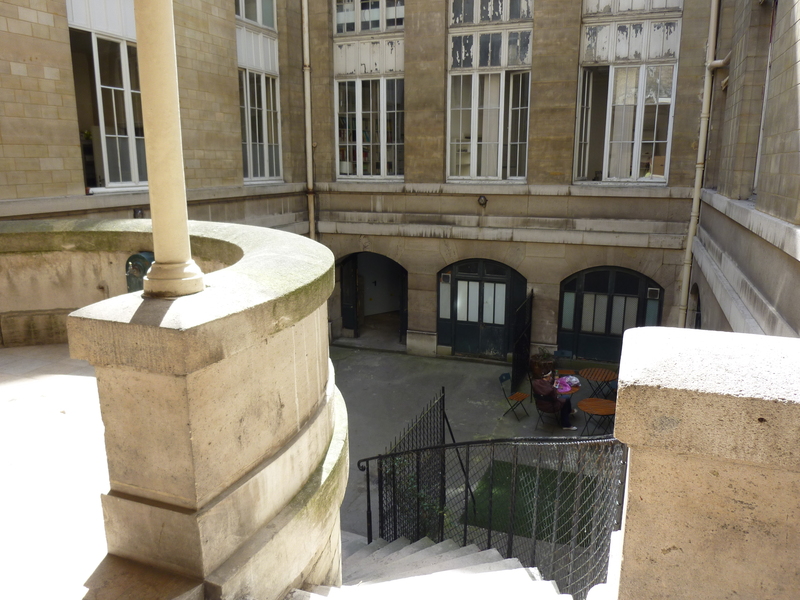 Across the courtyard was Escalier B. We had a key to unlock this door. Inside, a flight of steps led upwards to the elevator landing. I never failed to enjoy the process of getting from the street to the apartment. Notice the chasse-roues in the photograph below. The next place we rented had a street door with a digicode; one walked through a narrow corridor and out the back door to a tiny courtyard where the sun seldom penetrated. Across the cobblestones was another little building – a former workshop that had been built behind the apartment building, hidden from the street. A secret house. 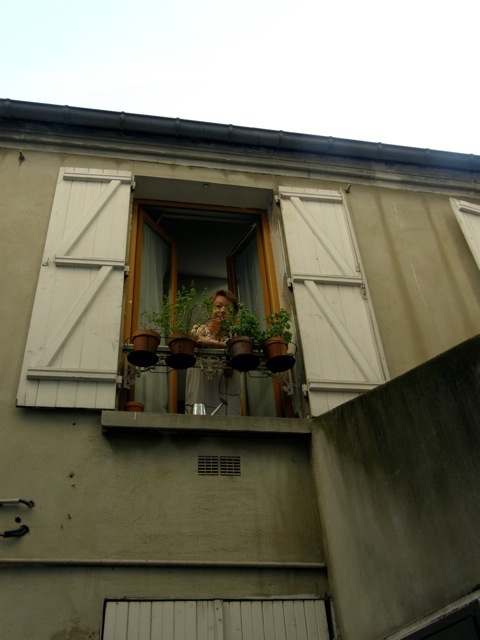 Norman took this picture of me looking down from the upper window of our secret house. I am endlessly fascinated by hidden and secret spaces visible only to a few. The Paris of the boulevards and public spaces is only a fraction of the full city, and most of that other city lies behind walls, or behind entire buildings. 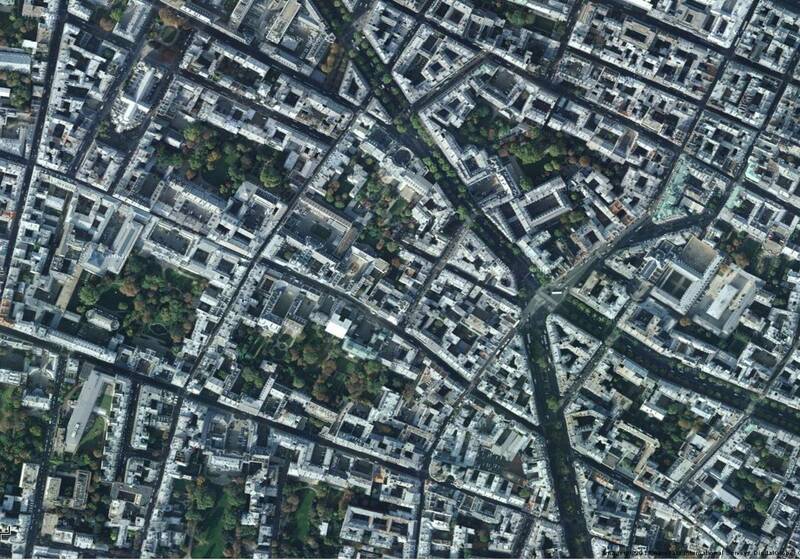 Consider this satellite view: the buildings are hollow, and the streets take up a relatively small part of the space. Most of the open space is in the interior of the blocks. And look at all those trees – many of them are not visible from the street. In the centre of the city, where former residences have been converted to offices, it is possible to enter some of courtyards, since the street doors are left open for customers and employees. Elsewhere, one catches only a glimpse as a resident enters or leaves the building. 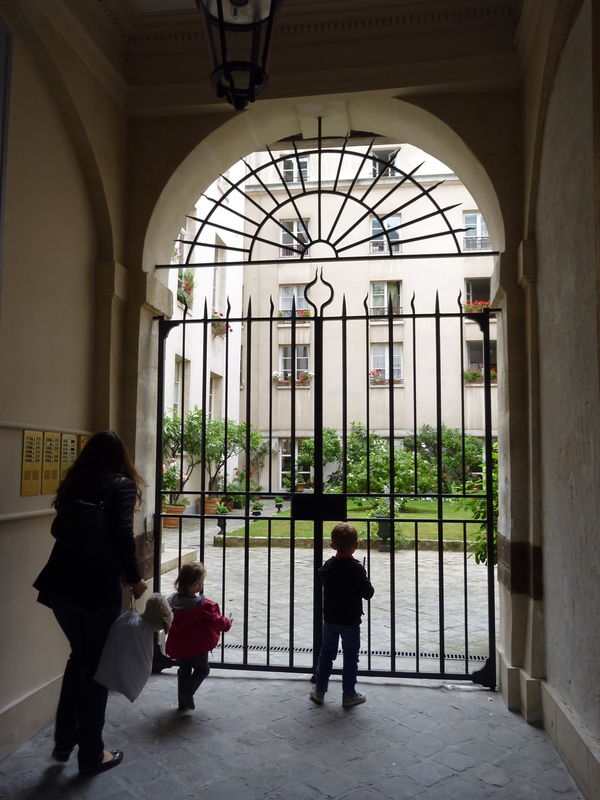 I keep photographing courtyards and gardens on our trips to Paris. I am particularly drawn to those with greenery, but even a paved space with a few parked cars can excite my curiosity. There might a statue. Or an interesting door. Or a bit of an older building hidden behind a new one. You never know. You have to check them all. Courtyards can be classified in various ways. Some are meant for vehicles to enter; others admit only pedestrians; and a few are little more than air shafts penetrated only by daylight. Each type can be further categorized into forecourts separated from the street by a wall or fence, centre courts surrounded by buildings, and rear courts behind buildings. Among those accessible to cars, a nice example of a forecourt is the one in front of the Canadian Embassy on the rue du Faubourg St-Honoré. Unlike the American and English embassies, which are bristling with unfriendly-looking security guards, this one stood open and welcoming. It made me feel proud to be Canadian. And here is an example of a centre court for cars. It is mostly garages, some of which may be used as work spaces. Notice the little statues. Older versions of this would have had stables rather than garages. More modern versions include the courtyard with access to underground parking. 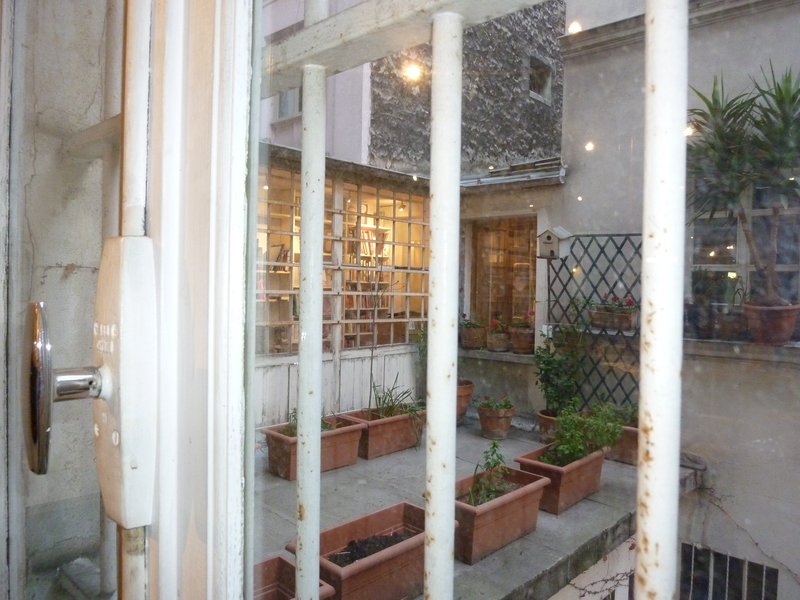 I took the photograph of this rear courtyard from the windows of Deyrolle, the taxidermy emporium. Photography inside the store is forbidden, but photography from the windows is allowed. A further category might be the series of two or more courtyards. Indeed, the courtyard of our first apartment had an archway in one corner leading through to another courtyard. Here, the progression from one space to another can be seen from the entrance. Alas, the “Access Interdit” sign prevented me from exploring. 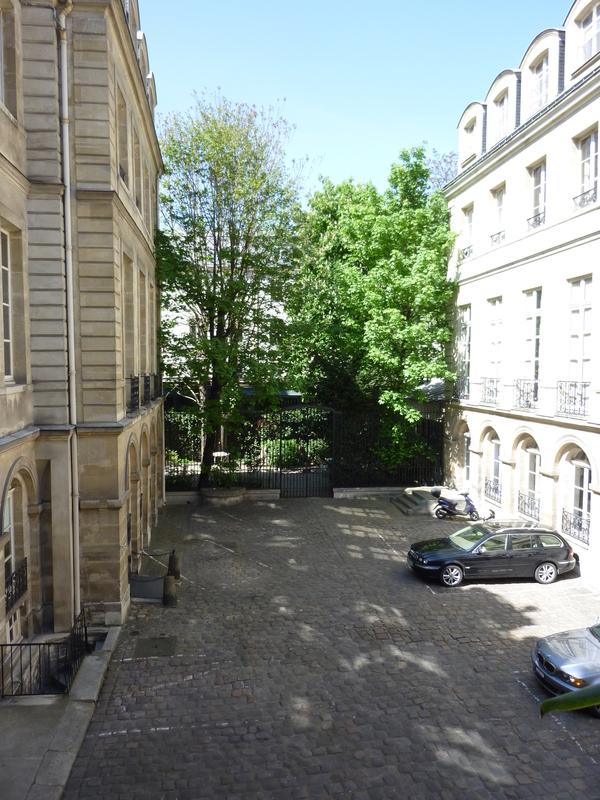 Then there are all the types of courtyard that are accessible only on foot. Most are the centre court type, but there are some forecourts, mostly on very grand buildings. This one is hidden from the street by a thick hedge. 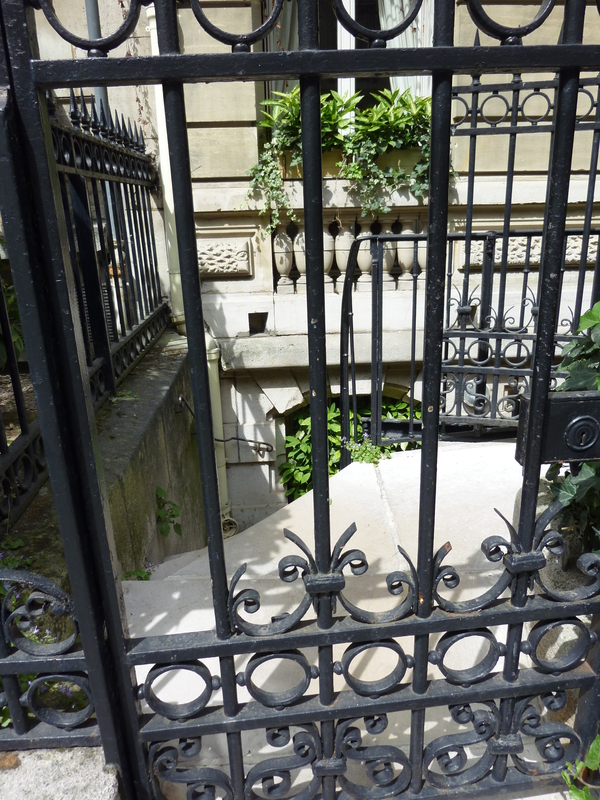 There are even a few examples of what the English would call an “area,” known in French as a “cour anglaise” – a sunken space between the street and the front wall of the building, entered by steps leading down. Centre courts are more common. This woman, entering with her two children, kindly allowed me to photograph this hidden garden when I asked. Centre courts may also be sunken. This is in one of the buildings belonging to the Ecole de Medicine of the Université de Paris in the Latin Quarter. This one, taken behind a bookshop in the Oberkampf neighbourhood, has a little container garden on the roof of a lower storey which appears to open out to a sunken space below street level. 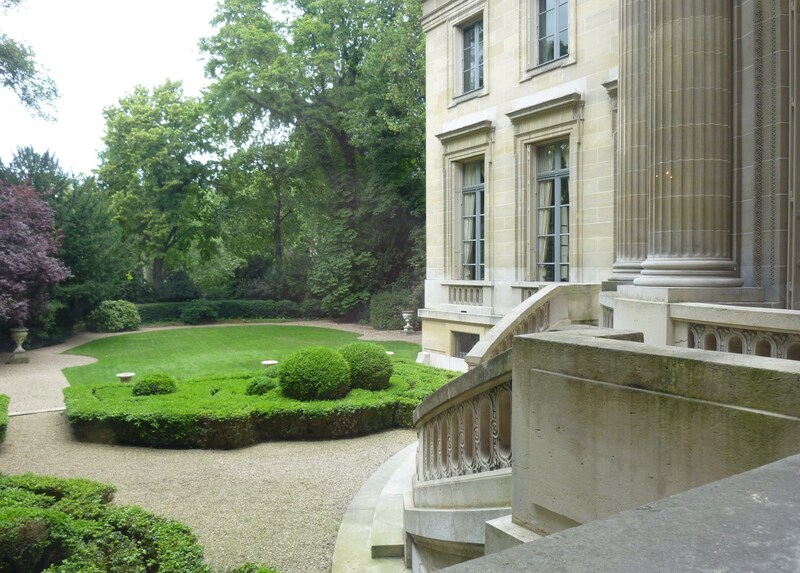 Spaces behind houses include a few rare instances of back gardens, like the lovely one at the Musée Nissim de Camondo, which backs onto the Parc Monceau. As for the air shaft version, here is the view from our bedroom window last May – a space that lets in daylight during the day and at night ensures a quiet sleep, since the noise from the nearby streets does not penetrate. We never found the entry to the ground level of this space; this is our only view of it. The more I look for hidden spaces, the more I find, peering into cracks and tiny openings. And if I can see it, I can photograph it and enjoy it all over again when I get home. 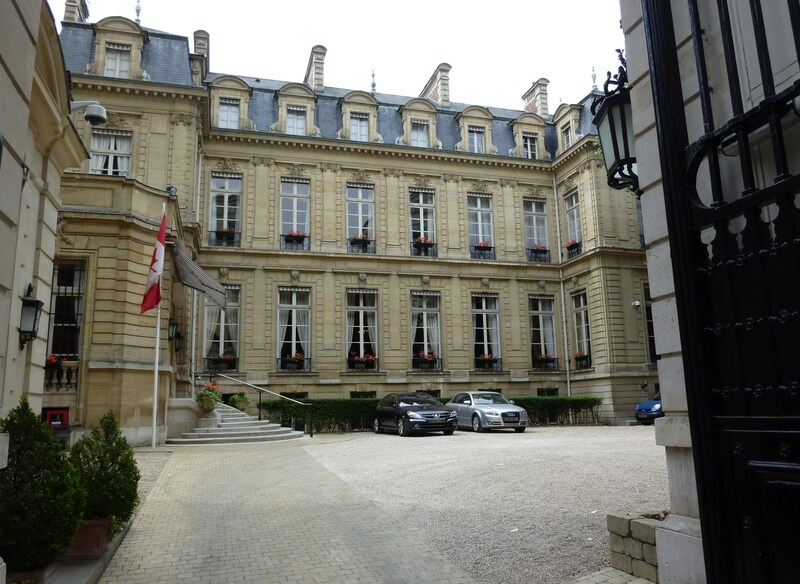 This entry was posted in Paris architecture, Paris gardens and tagged air shafts, Canadian Embassy in Paris, courtyards, Deyrolle, digicodes, Ecole de Medicine, gardens, Musée Nissim de Camondo, Parc Monceau. Bookmark the permalink. 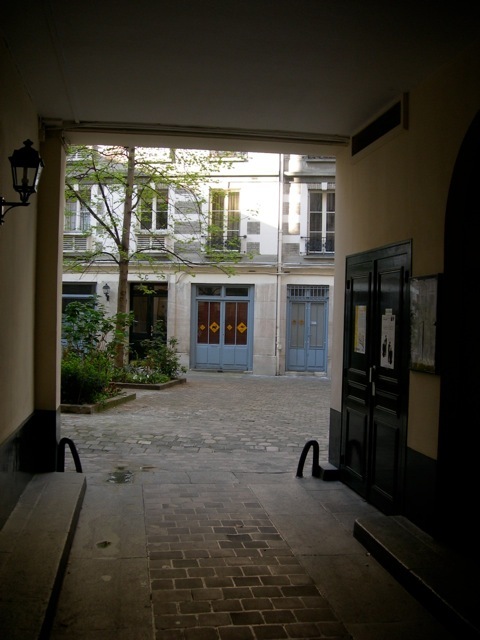 Paris is its courtyards. Until I discovered that, I really didn’t know Paris at all. 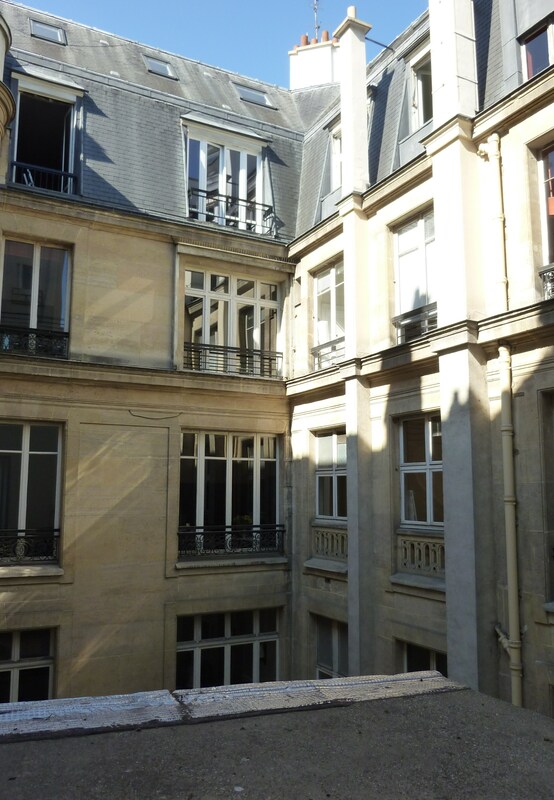 For most visitors to Paris, unless they rent an apartment, they will never really know the joy of the inner courtyard. I have mixed feelings about these. Obviously the surprise of coming across a hidden little world is always a pleasure, but on the other hand, I don’t like the idea of a large percentage of the city being hidden away from its inhabitants. 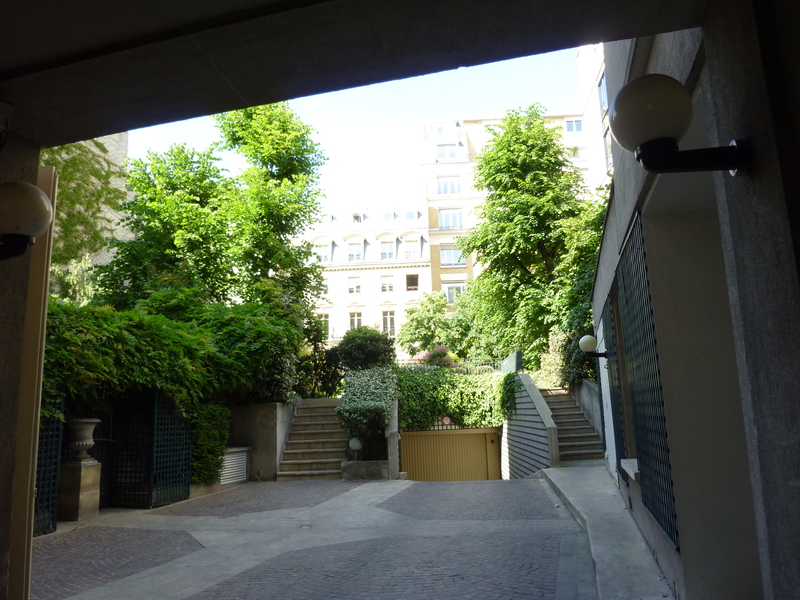 Much of Paris is quite oppressive because of these large, hidden spaces too, and sometimes it would be nice to have the garden/courtyard out front, to bring a little more air and break up the monotony of a Haussmannian street. 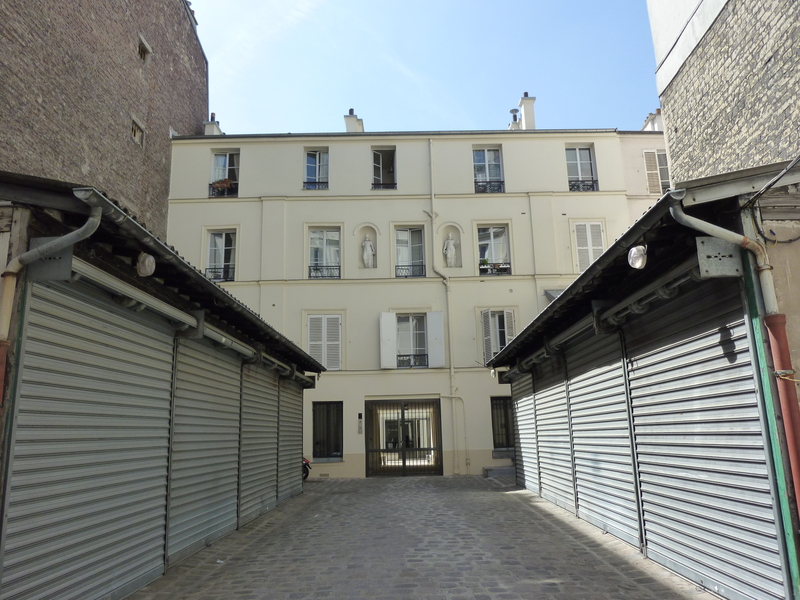 I think these spaces are necessary for the sanity of Paris’s residents. In a city that dense, with that many visitors, one would need somewhere private and quiet to retreat to. And it’s not as if Paris is not well endowed with beautiful gardens and public parks open to all. So, on balance, I think there is a value to the hidden city. It rewards those who seek it out. We were in a shoe shop one day that had a little courtyard behind the shop with the door open. I was deeply bored so I stepped out into the area and took a picture. Man did I get a florish of rapid fire non, non, nons followed by a blistering round of french that did not need translation. I guess I should not have assumed that the open door meant I could go there. Completely my fault for not asking though. One of my favorite things about Paris is that thing that happens when you instantly transition from the hustle of the city into a quiet tiny space full of flowers or trees. Next time we will watch for more of the spaces you show (and be sure to ask permission). I too, am a sucker for those hidden gems…. and I took many a quick shot, not always a grand succes but always very rewarding. When I see somebody, I always ask and explain that it is only for my private joy and pleasure. If denied, I never insist – although the Parisians are not known for their friendliness, they can be quite human when they sense a true interest in ‘their surrounding’. Paris2011; you would never wish for your visitors (not friends!) to come to your place and just explore the place without asking first; it’s the same for the owner of this shop – the patio behind is their ‘private garden’ in every sense of the word. Now, dear Philippa, I regret that I never note the exact location of my secret discoveries… I found some amazing chimney structures behind one of those ‘rarely open’ doors and have no idea where I took those photos…. Nice post. I love the hidden courtyards behind the heavy doors. Thanks for posting often about my favorite city. Great article. I must say that is terrorists began blowing up Canadian buildings and people, your embassies will probably be “bristling” with guards as well.